I have been out of town the last two weekends. So our fridge is looking pretty bare. I didn’t know what to cook for dinner tonight. I didn’t want to go out to get something from the store. I was thinking I could use chicken and add it to rice or pasta. I was thinking I had a jar of sauce, but when I looked in the pantry I didn’t see one. But I did see a jar of artichoke hearts. I was thinking I would add them to the chicken. Then I thought I would also use a can of chickpeas. I love the richness that chickpeas adds. So sometimes out of necessity you come up with an easy recipe of things you have on hand. Drain the chickpeas. Rinse off the chickpeas. Put the chickpeas in a large pan. Turn the heat up somewhat high and let the chickpeas start to dry off. When they start cooking sprinkle them with salt. Keep the chickpeas moving so that they start to get evenly toasted. Add a teaspoon of butter. Keep cooking the chickpeas. Add a little more salt. Let them cook more. Then add some butter. The chickpeas should be browning a little bit. Cook the chickpeas to your desired doneness . . . I like them browned and starting to get a crunch. Drain the chicken, then add it to the pan. Sprinkle the chicken with garlic salt. Stir up the mixture and cook the chicken a bit. Canned chicken is already cooked so it doesn’t need that long in the pan, or that high of a heat. At this point I turned the heat down. 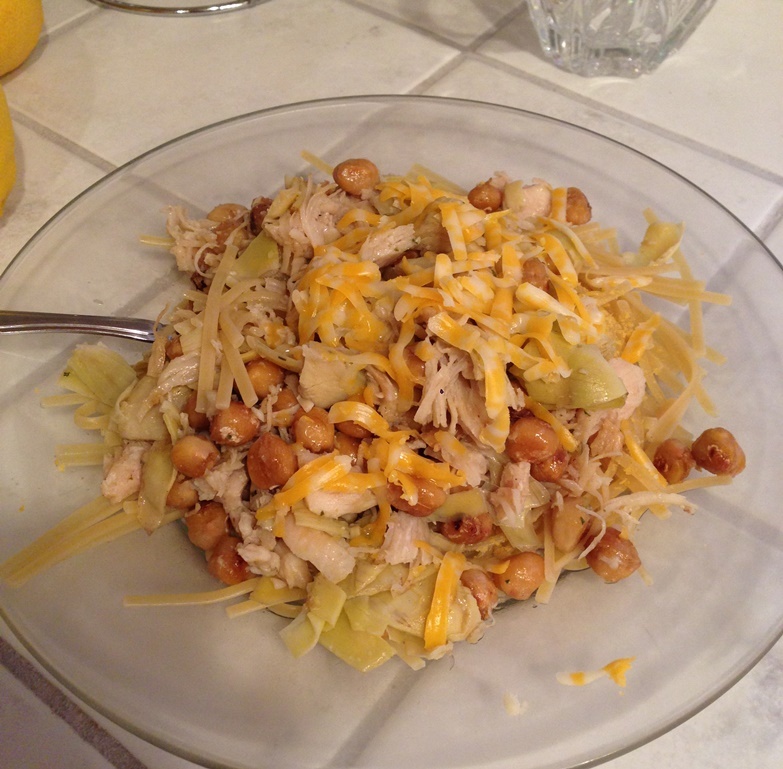 Add the chopped artichoke hearts. Cook everything until it is hot. While the chicken is cooking boil the water for the pasta. Cook the pasta. I used linguine because that is what I like. Once the pasta is cooked to your liking, drain it, then put it on a plate with some butter. 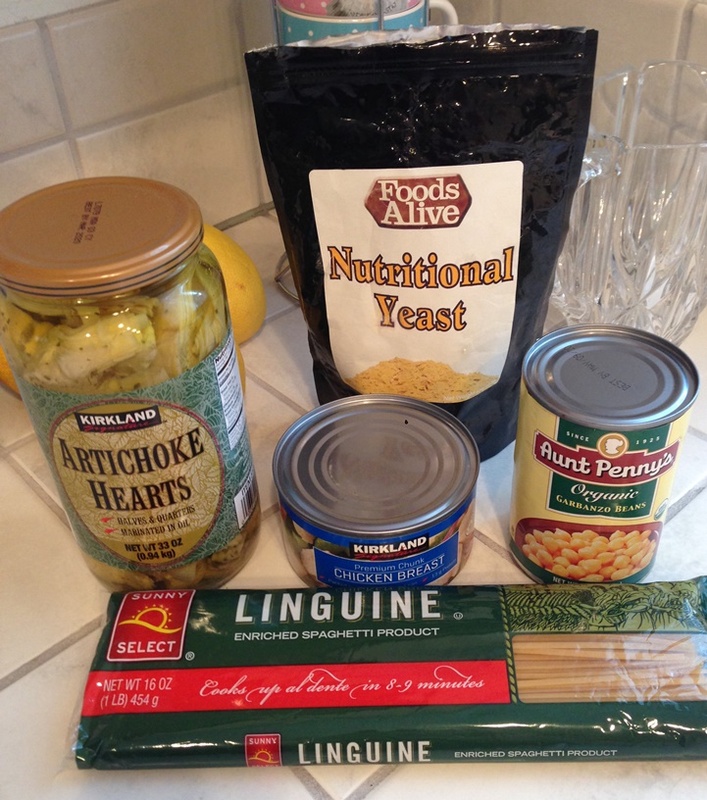 Sprinkle 3/4 of a teaspoon of Nutritional yeast on the pasta. Then put the chicken mixture on top of the pasta. Add pepper if you would like and more garlic salt if you feel it needs it. Grate a small amount of cheese on top. *I would have liked to have used Parmesan, but all I had was a Cheddar Monterey Jack blend. I think this was pretty good. It is very rich with the beans and the artichokes. It is super easy. It was nice because the artichokes gave it a flavor that we don’t always have. So it was a bit different for us. I really liked it. I was going to add some Kalamata olives, but I decided not to. What do you think? What kind of pasta would you use? Now what do I do with the rest of the jar of artichoke hearts? Years and years ago I went to a Princess House party . . . . do you know what that is? It is one of those home shopping parties where a consultant brings products to a hostess’ house. The hostess invites her friends over to shop. They place orders for the product and it arrives a couple of weeks later. There are a lot of products that are sold like this. Princess House crystal is one of them. They have other products . . . at one time they had cutlery, cookware, and decorative gifts. Now I am not really sure what their product lines include, but back then I was really into it. My favorite line was their Fantasia line. It seemed more sturdy, to me, than their regular line. Also one of the sales pitches was that you could paint the plates (or serving dish) on the bottom and that would give you a different look. I purchased a lot from the Fantasia line. I have never once painted a piece. I also had a party one time and I got a china cabinet full of product from that party. Well, back then, when I was buying the crystal and having the parties, one of the ways they would sell the crystal is to have the consultant make recipes IN the crystal while at the party. I have several recipes from those parties that I use or have used often over the years. Recently I had the opportunity to make one of those recipes. I hadn’t made it in a long time — and dang it is so good. But you will see from the ingredients, why it is not an everyday type of recipe. But artichoke dip sure is good. The picture is of the actually recipe I got from one of the parties. But I also typed it up here for you with MY slight modifications. After you drain the artichoke hearts, chopped them up. Make smaller than bite sized pieces. Mix all the ingredients together – either in the dish you are going to bake it in or in a bowl then put it in the dish. You might want to skip the salt all together (if I am saying that, you REALLY might want to skip the salt) because all the other ingredients seem to make this dip salty enough. Bake in the oven at 350° F for about 15 or 20 minutes. Or as the original recipe says you can microwave it on high for 6-8 minutes (until cheese is melted). I always cut up the artichoke hearts because when you are trying to scoop them up with a chip or a cracker a big chunk of artichoke heart is just too difficult to deal with. This last time I doubled the recipe (except for the chilies) and used one of my Princess House Fantasia baking dishes! I mixed it, baked it, and served it in the same dish. 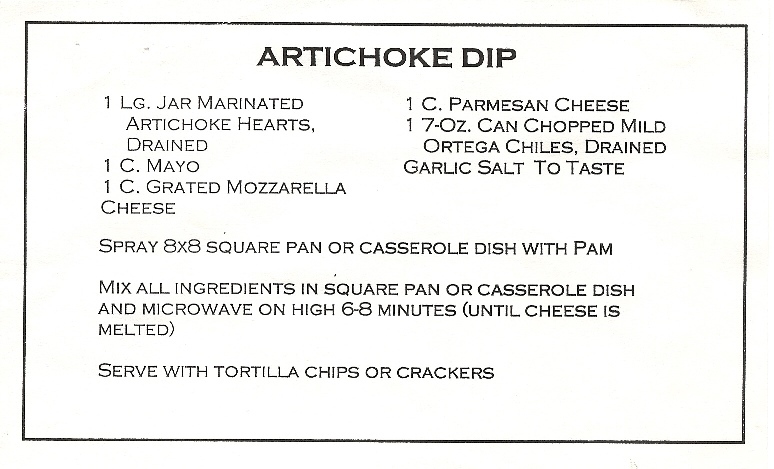 Artichoke dip is a really popular dish. It is easy to make and tastes really good. So I am sure you have heard of it. I bet you even have your own recipe. 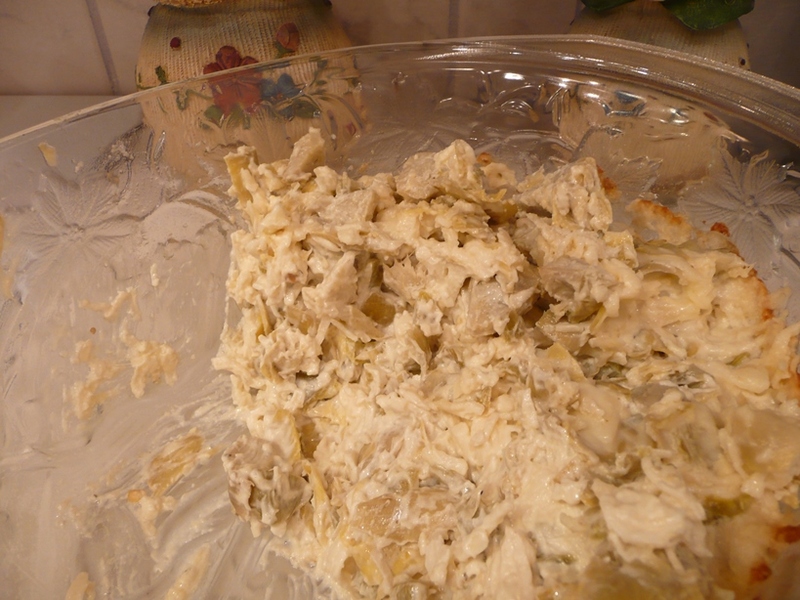 What do you do to make your artichoke dip? 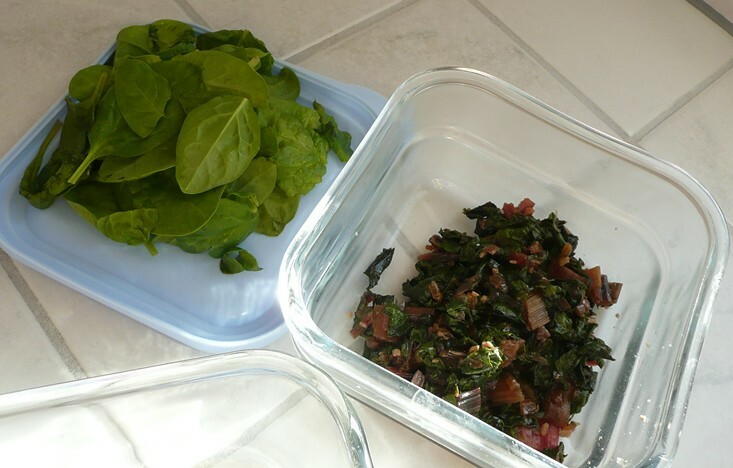 When I was putting away the groceries I noticed I had a container of “fresh” baby spinach that needed to be used. There was about a handful of nice looking leaves. I had also noticed we had our leftover Rainbow Chard. I had cooked the Rainbow Chard as I usually do with onions and garlic and salt in some olive oil. I had even added a bit of Worcestershire sauce to help over power the “green” taste. So the chard was tasty. I was just concerned that it would get too cooked after baking for 25 minutes. But . . . I didn’t have the time nor the desire to go out to get spinach. I needed to use up the chard anyway so . . . why not? Also, the store I was at did not have the usual brand of chicken breast so I bought some that I have never seen. They were quite large. So below is what I ended up making. I thought to take a few pictures while I was making it, but after I got home from class and was in get-it-on-the-table mode I forgot to take pictures of it cooked. It was good. I will be making it again . . . . next time with spinach and then who knows. It seems any green you would cook would work. 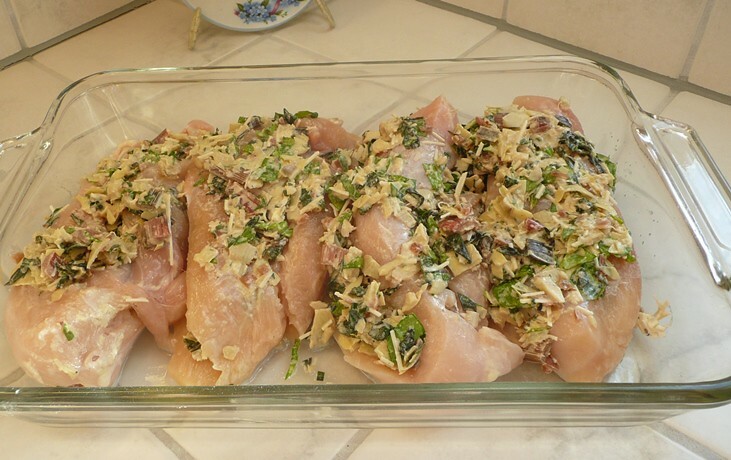 Preheat oven to 375° F. Sprinkle garlic salt on both sides of each chicken breast. In a large bowl mix the spinach, chard, artichoke hearts, almonds, Parmesan cheese, and powders. Use two utensils to cut the Neufchatel cheese into the mixture. Put the chicken in a 9X13 glass casserole dish. Spoon the filling onto one side of each of the butterflied chicken breasts, then fold over. Spoon any remaining filling onto each folded chicken breast, if you have enough put it all around. Bake for at least 20 minutes . . . until chicken is cooked to your liking. 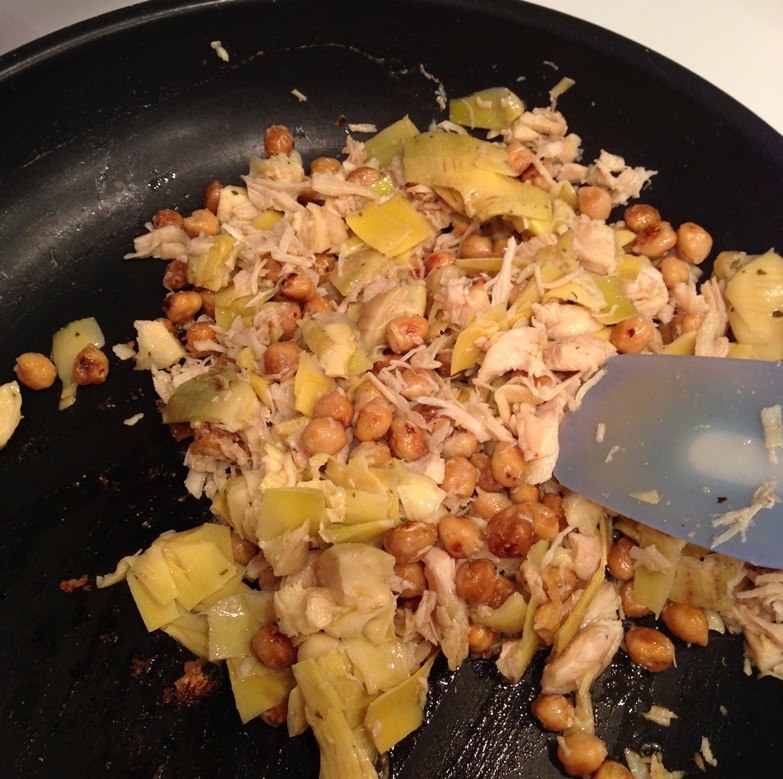 *I poured a little bit of the artichoke marinade on the chicken. **Next time I am going to add more AND sprinkle some on top! The chicken breast I used were so huge, I actually had to cook them for 40 minutes. PLUS, I left them in the oven with it turned off for an additional 10 minutes while I prepared our plates with the rice I served. I don’t think that the chicken I normally buy would require 40 minutes. Neufchâtel is like cream cheese in that it has the same consistency, so it just didn’t stir into the other ingredients. I had to “cut it in” with two utensils. Basically you want to make sure there are no clumps of cheese. The store I was at had only ONE brand of Neufchâtel cheese and I don’t know how authentic it is because it tastes just like cream cheese to me. Perhaps on my next go at this recipe I will find a brand that I feel is more authentic. I will do some research. Sounds yummy, huh? Don’t you think any green that you would cook would work? If you make it with another green (kale, collard greens, etc) let me know. Go wild!